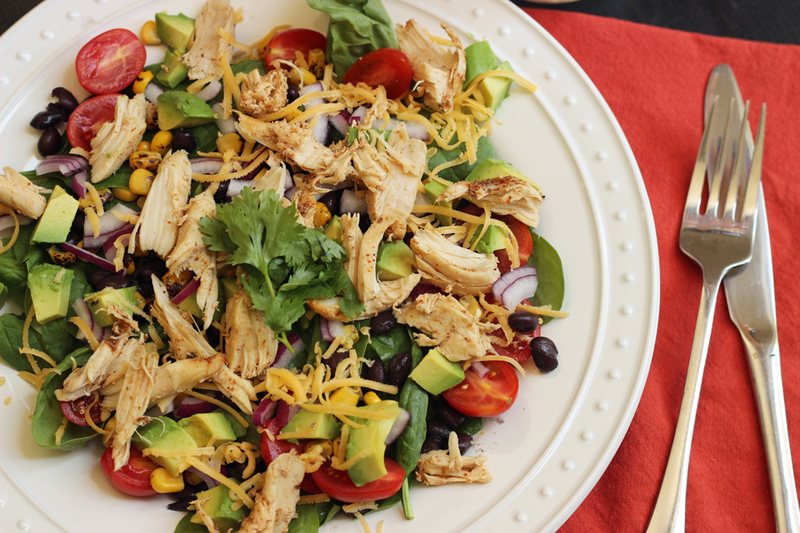 This Santa Fe Salad is super easy to pull together. 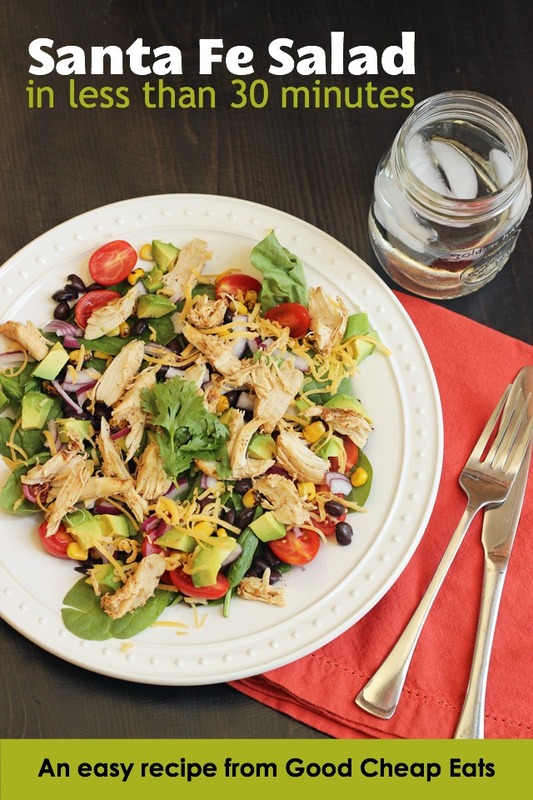 Signature corn and black beans get added protein from shredded chicken and other tasty toppings, making for a quick and easy dinner that’s easily packed to enjoy on the go. You don’t have a lot of time. How can you bridge that gap between no time to cook and the fact that YOU GOTTA EAT?! Take a gander at that beautiful Santa Fe Salad. Doesn’t that look amazing?! What would you say if I told you you can assemble that plate of lusciousness in about 15 to 30 minutes? I’ve waited longer in line for burgers at a fast food joint! Trust me, this is infinitely healthier and tastier than any take out burger. I call this is one of my lazy cook meals. Seriously. It’s so simple, it feels lazy. But, it’s also delicious, so it still counts. And it’s all real food, no fake-fake here. I’ve probably told you before about some of my “cheater” ingredients that I love to buy. I call them real food convenience items: frozen chicken tenders (or even a rotisserie chicken! ), baby spinach, fire roasted corn (from the freezer section), and canned beans. Sure, there are cheaper ingredients to buy. You could roast a whole chicken, clean a pan full of (sandy) full grown spinach, cut the corn off the cob, and cook the dried beans yourself. 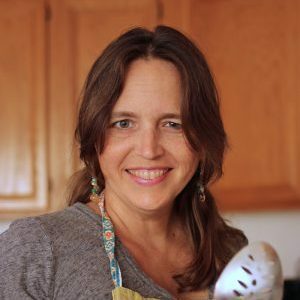 Those methods are fantastic for trimming your grocery bill and eating well. I’m not abandoning those strategies, but I also know they have their place. When I’m in a pinch, these minimally-processed ingredients that are SUPER DUPER CONVENIENT fit the bill perfectly. They help me take short cuts without sacrificing taste or nutrition. This salad is one of the places they shine. What Is In A Santa Fe Salad? All on a bed of spinach. Then you can dress it up how you like with salsa, cilantro, olive oil, sour cream, lime, however you like. 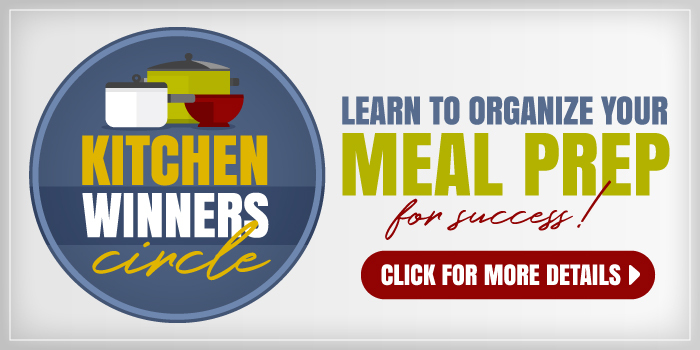 Cook the chicken quickly in a skillet. I used my Homemade Chipotle Taco Seasoning Mix because it’s easy to make and keep on hand all the time. Plus it’s cheaper than the packets and doesn’t have crappy ingredients. If you don’t have time to make the mix, you can dash on chile powder and cumin, salt and pepper if you like instead. Once the chicken is cooked, shred it with your fingers. If you’ve got leftover chicken from another recipe or slow cooker chicken in the freezer or a rotisserie chicken, by all means use it. Shred the meat and toss it with some taco seasoning mix. 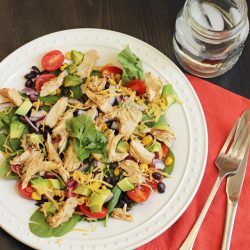 While the chicken is cooling a bit, assemble the salad: baby spinach, chopped tomatoes (I like to half cherry or grape tomatoes), dice avocado, drain a can of beans, thaw the corn, slice some onion, chop cilantro, and shred some cheese. Drizzle on the lime juice and other toppings and dig in! Seriously, it won’t take long at all. The whole thing comes together in less than half an hour, even less if you buy the cheese already shredded. This is a great meal to pack for work, school, or the ball field. Feel free to vary the toppings; this is just a good base to start. After you’ve enjoyed it to your heart’s content. I’d love for you to give it a starred review below. Bon appetit! 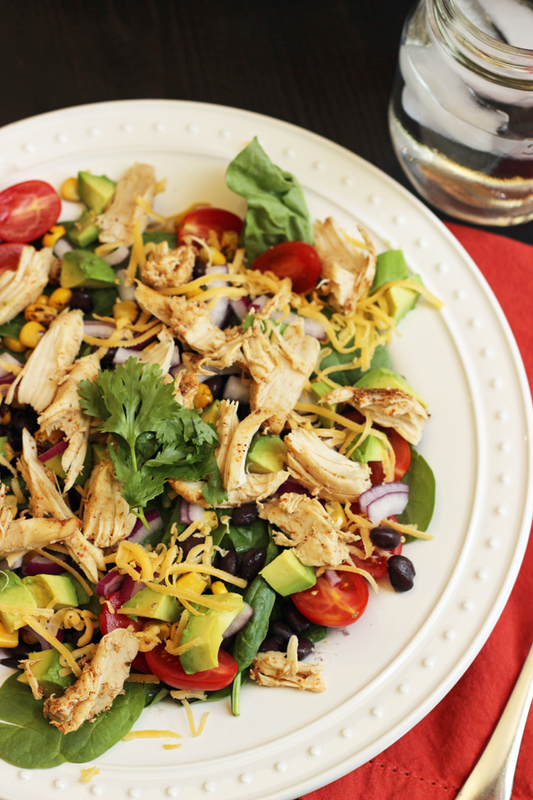 This Santa Fe Salad is super easy to pull together. 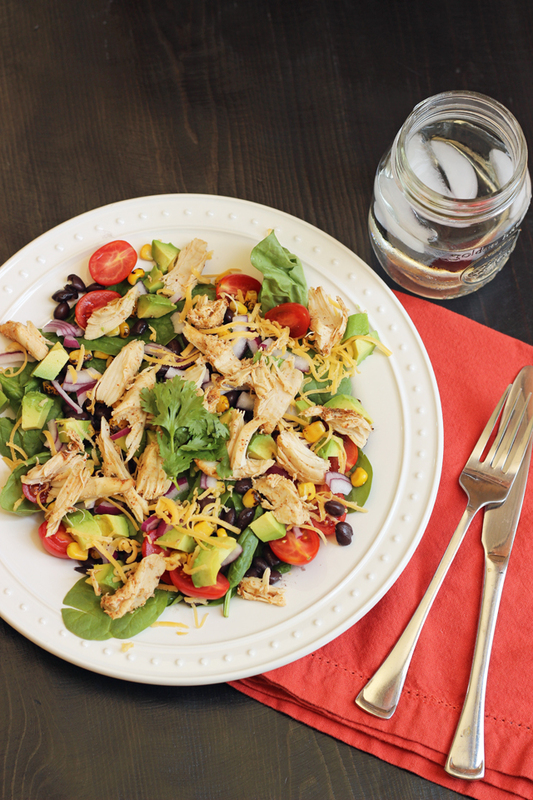 Signature corn and black beans get added protein from shredded chicken and other tasty toppings. Heat the oil in a large nonstick pan until shimmering. Add the chicken and the taco seasoning mix. Cook, turning frequently, until the chicken is done, about ten minutes. Meanwhile, divide the spinach among four plates, or plastic boxes with lids if packing for work or school. Divide the beans, avocados, tomatoes, corn, cheese, and onion among the four dishes. When the chicken is done, remove it from the heat to a cutting board and shred it into bite sized pieces. Divide the chicken among the salads. If you’re making the salads in advance, allow the chicken to cool before adding it to the dish. Sprinkle the salads with chopped cilantro. Serve with a squeeze of lime juice and a drizzle of olive oil or salsa and sour cream if you prefer. P.S. This is one of my favorite skillets. I bought it a few years ago and we’ve ended up using it several times a day! 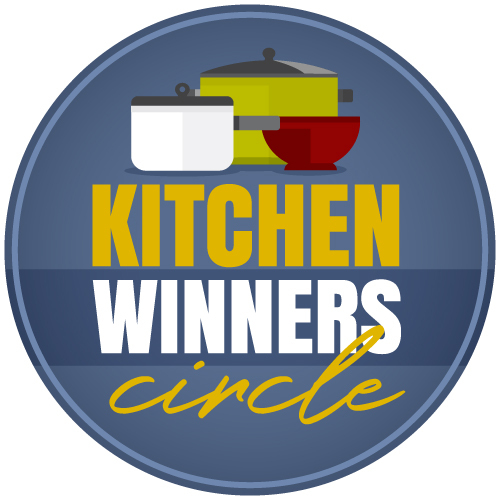 It works great for these quick fix chicken recipes and any time I want lots of space, safe nonstick coating, and a lid. This is delicious. Husband and I both loved it. We’ve had it twice this week. Made it with leftover turkey ‘cuz that’s what we had. Thank you! This looks great! I’m thinking sour cream or yougurt would be pretty amazing on this too. Thanks for sharing! Oh my stars, Jessica! This is fantastic! I had soup on the menu for tonight because it would be cheap and easy…but since we are in the middle of a ten days plus streak of triple digit heat, I just couldn’t do soup tonight. Low and behold, an email from you that saved the day! I had all of the ingredients except for the two important ones (chicken and spinach) so I popped over to the closest store, picked up some spinach and a rotisserie chicken and viola, dinner was on the table in about 40 minutes INCLUDING the trip to the store. And THAT is how dinner is won. Boom! The flavors in this are just right and made for a perfect it’s-too-hot-to-cook meal that was tasty, filling and light. Even my picky eater liked all the ingredients, just not together…LOL! Thanks for sending this recipe my way! Thanks for this recipe! I am SO going to make this, and I’m putting what I don’t have on the grocery list right now! Let me know how it goes! The comments form has some outlined stars. Click however many you think it gets after you’ve tried it. Thanks! This was a big hit with my family. We are trying to eat less take-out, and this will go into our regular rotation because it was easy and delicious. We made it with rotisserie chicken, and we each customized the ingredients to our liking. Thanks for sharing this recipe! Glad to hear that it’s going to work well for you! Ha, I had this on the menu before I got the email about it! I heated the chicken in oil seasoned with Mexican spices and used a little sour cream as the dressing. We all loved it! Just finished this for dinner and husband and I loved it! It will go into constant rotation now. Thank you! Glad you liked it. Thanks so much for the feedback! Constant rotation is high praise! Is the nutrition information right? Where does all the fat come from? I’m not a nutritionist (we use a plugin to generate the data), but I’m guessing it’s from the avocado and cheese. Both of those could be reduced by half and still give you a really tasty salad.